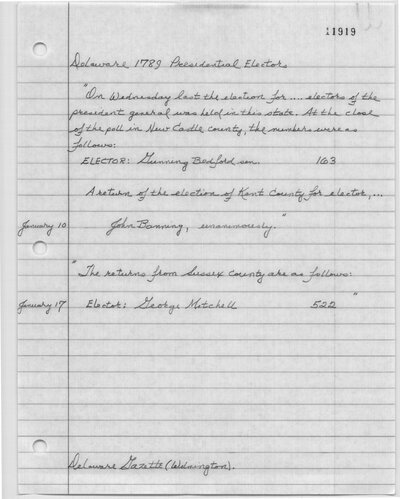 John Banning, George Mitchell, Gunning Bedford, Sen.
"The election law, passed 28 October 1788, called for elections on 7 January 1789, with voters in each county required to hand in, 'on one ticket or piece of paper,' the names of two persons (of whom at least one could not be an inhabitant of the county) for Representative, and the name of one person (who must be an inhabitant of the county) for Elector. The persons receiving the most statewide votes would be the winners." The Documentary History of the First Federal Elections 1788-1790, Volume II. The University of Wisconsin Press. 81-85. Kent County voted for John Banning "unanimously". The Delaware Gazette, and General Advertiser (Wilmington, DE). January 10, 1789. The Delaware Gazette, and General Advertiser (Wilmington, DE). January 10, 1789. The Pennsylvania Packet, and Daily Advertiser (Philadelphia, PA). January 15, 1789. The Delaware Gazette, and General Advertiser (Wilmington, DE). January 17, 1789. DenBoer, Gordon and Lucy Trumbull Brown, ed. The Documentary History of the First Federal Elections: 1788-1790. Vol. II. Madison, WI: University of Wisconsin Press, 1976. 81-85.